2014 began with a fun and healthy project. This has been in the works a couple of months now. I helped develop this Freekeh Meatballs recipe (shown above) for my client, Freekehlicious, and photographed it. I was super delighted to see Freekehlicious debut on Dr. Oz this past Monday serving these high in protein and fiber and low in glycemic index Freekeh Meatballs. You can catch the Monday "Toxic Acid Takedown: Fighting inflammation" episode featuring freekeh as one of the foods for detoxing for the new year on Dr. Oz's site. Find the baked and super delicious Freekeh Meatballs recipe and my photograph on Freekehlicioius' site here. The recipe also appears on Dr. Oz's site here. Many congrats to the ladies at Freekehlicious for making this super grain a 2014 detox and healthy living must. 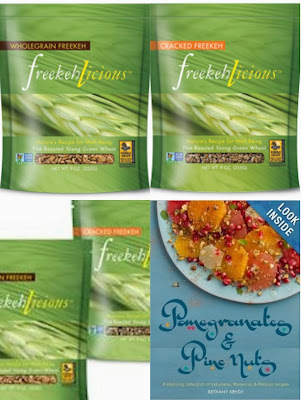 Freekeh can take on many forms. 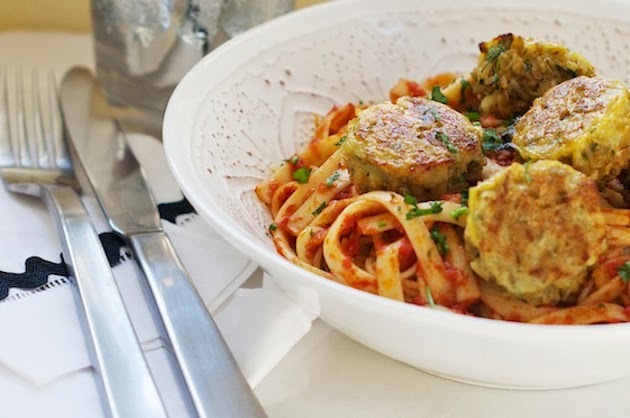 You can serve it in a playful vegetarian spaghetti and meatballs rendition as shown above or in a mouthwatering vegetarian salad, as shown below, and shared in my Freekeh with Brussels Sprouts, Apple, Dried Cranberries, Honey and Pomegranate post. You can find the original recipe I developed and photographed for Freekehlicious here and here. 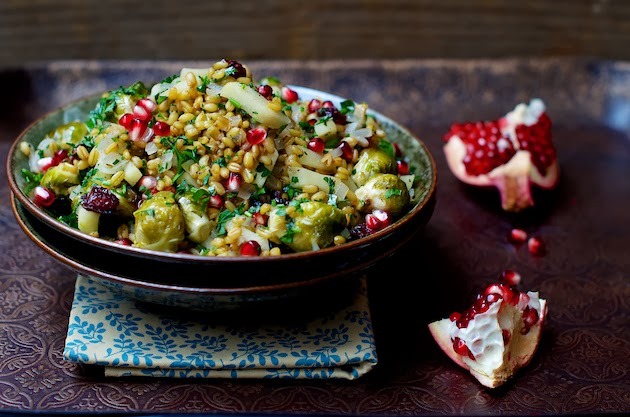 The carnivores among us can play with the lamb and freekeh dish, from Bethany Kehdy's Pomegranates and Pine Nuts cookbook, appearing on her site, among other freekeh recipes she shares on Dirty Kitchen Secrets. I can't wait to try it. Giveaway available to readers with a US mailing address only. Please enter through Rafflecopter below and leave a comment in this post about your healthy New Year's resolutions. The drawing is done by random through Rafflecopter. This post is a part of my professional collaboration with Freekehlicious. I've never come across freekeh here. Both salad and meatballs look amazing! The combination of colors and serving..nice work! I am going to stop eating because I am bored. I will eat less white wheat flour products. I haven't tried freekeh but your meatballs look delicious! I've never had freekeh before (at least I think I haven't??) but I bet it tastes so good! What a fun giveaway, Shulie! What a great spin on the classic meatball, Shulie. I'm glad this dish will get such a wide audience -- it deserves it! Super Freekeh! Yow! Like Lora, I don't think I had freekeh yet. See, after eons of months, I opened my laptop to read my friend's blog, and TA-DAH! I learn something new. And of course the song is stuck in my head, I should at least Google the lyrics so I know the words. I'm also dancing. Thank you, Shulie for the cardio. Who needs coffee when we have Food Wanderings!